Samsung is about to launch a sports phone co-branded with adidas . 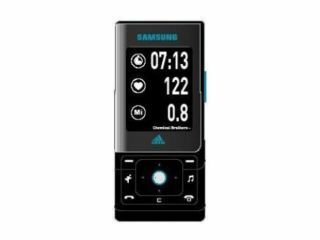 The Samsung SGH-F110 is a sports-featured mobile with personal trainer applications such as a pedometer, heart beat monitor, calories-counter and so on. There's also reported to be a voice coach feature to spur users on during their work out. The Samsung SGH-F110 adidas phone was first reported by a German website . Tech.co.uk has had confirmation that a co-branded adidas phone is due for release shortly, although there are as yet no confirmed plans to launch it in the UK. The F110 will include a 2-megapixel camera, multi-format MP3 player (with playlist option to match your workout), FM radio and MicroSD memory card support. The F110 is a quad-band EDGE enabled phone, with USB 2.0 and stereo Bluetooth connectivity. The F110 has a similar slimline dual-front design to the recently released Samsung SGH-F300. No specific on sale dates or price details have yet been confirmed.